After such a successful 2014/15 when they won the Premier League and Capital One Cup, very few people would have expected Chelsea to fall off the rails so spectacularly this season. However, a combination of key players losing form and manager José Mourinho struggling to find a solution, not to mention the distasteful Eva Carneiro episode, led to a string of defeats and ultimately the departure of the “Special One”. Guus Hiddink has been installed as interim manager until the end of the season with the club hoping he can repeat the achievements of his previous stint in that role or at the very least drive the club up the table and avoid the unthinkable threat of relegation. 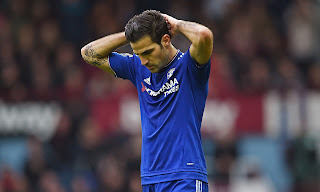 Although 2014/15 brought two trophies to Stamford Bridge, the news was not so good off the pitch, as the previous year’s £19 million profit was transformed into a £23 million loss – a deterioration of £42 million. 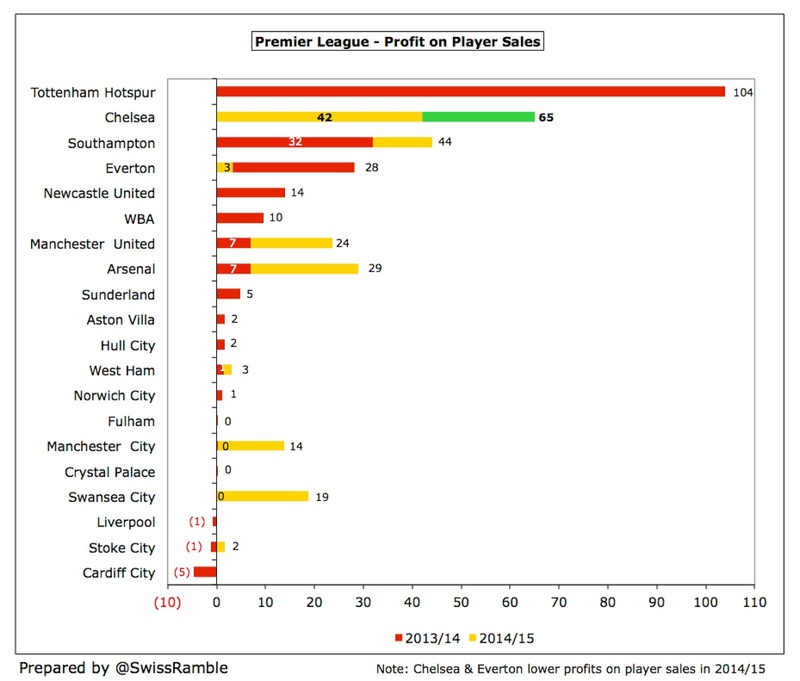 This was driven by two main factors: (a) profit on player sales fell £23 million from £65 million to a still impressive £42 million, principally due to the sale of Romelu Lukaku to Everton, Andre Schurrle to Wolfsburg, Ryan Bertrand to Southampton and Thorgan Hazard to Monchengladbach; (b) the wage bill shot up £23 million (12%) to £216 million, the highest in the Premier League, which might be considered the price of success, as it included hefty bonus payments. Revenue fell £6 million to £314 million, largely due to a £4 million decrease in broadcasting revenue to £136 million, as the increase in Premier League distributions was more than offset by not progressing so far in the Champions League. Commercial income was slightly lower at £108 million, while match day was largely unchanged at £71 million. Other expenses rose £7 million (10%) to £83 million, while there was a £3 million net increase in exceptional items, as this year’s figures included a £1 million loss on the disposal of investments, while last year’s accounts featured a £2 million credit for the release of a provision for compensation payments following a change in management. 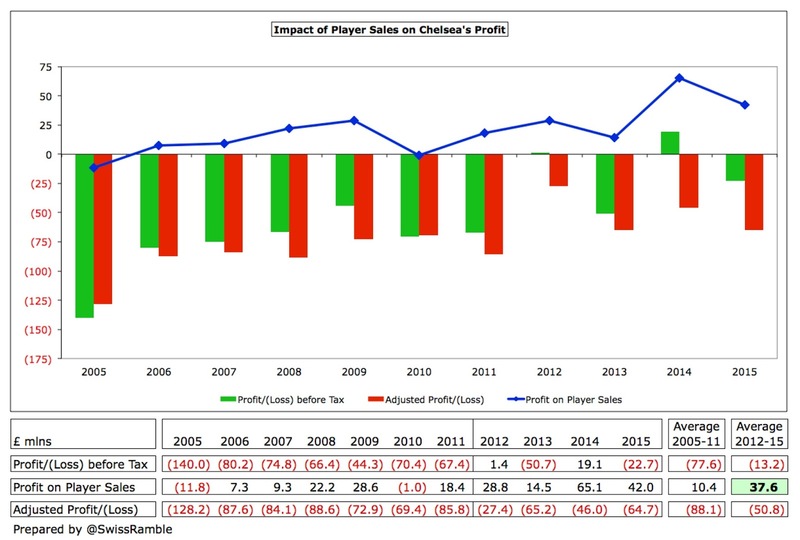 The only area that improved profitability was non-cash flow expenses, as Chelsea booked a £19 million impairment charge against player values last year, while player amortisation was £3 million lower at £69 million. Chelsea’s £23 million loss is likely to be one of the worst financial performances in England’s top flight in 2014/15. 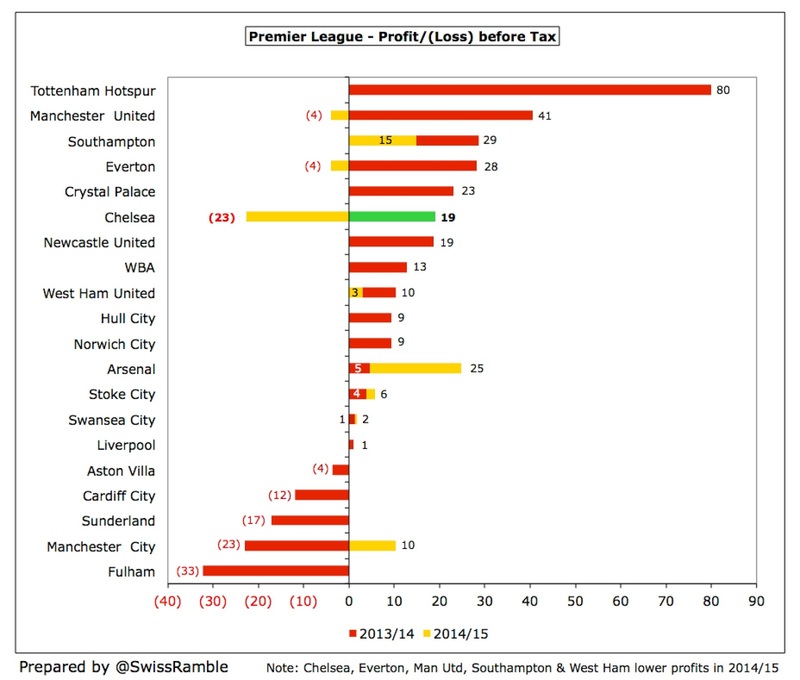 To date, nine Premier League clubs have published their accounts for last season with six reporting profits, the largest being Arsenal £25 million, Southampton £15 million and Manchester City £10 million. Manchester United and Everton have also announced losses, but much lower at around £4 million. 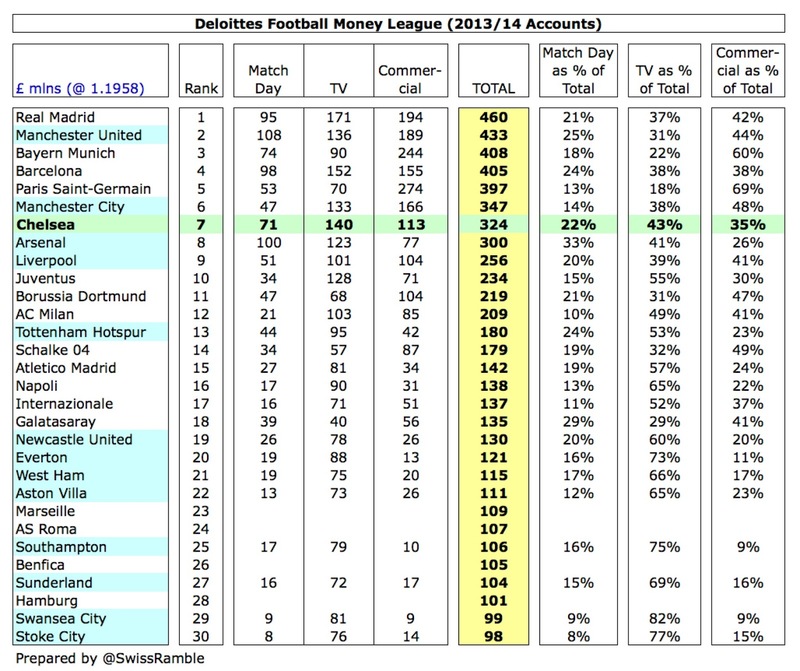 Although football clubs have traditionally lost money, the increasing TV deals allied with Financial Fair Play (FFP) mean that the Premier League these days is a largely profitable environment with only five clubs losing money in 2013/14. 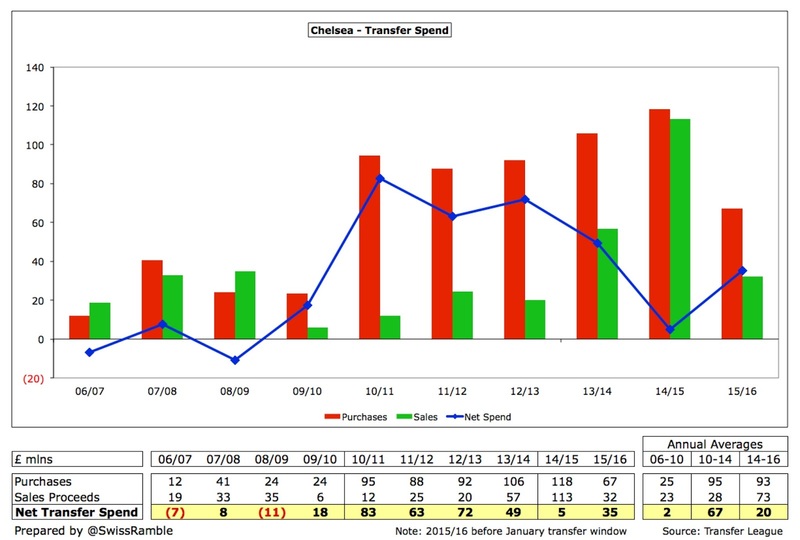 As we have seen, once-off profits on player sales can also be very important to the bottom line, especially at Chelsea, where the 2013/14 numbers were boosted by £65 million from this activity, which was only surpassed by Tottenham’s £104 million, almost entirely due to the record sale of Gareth Bale to Real Madrid. 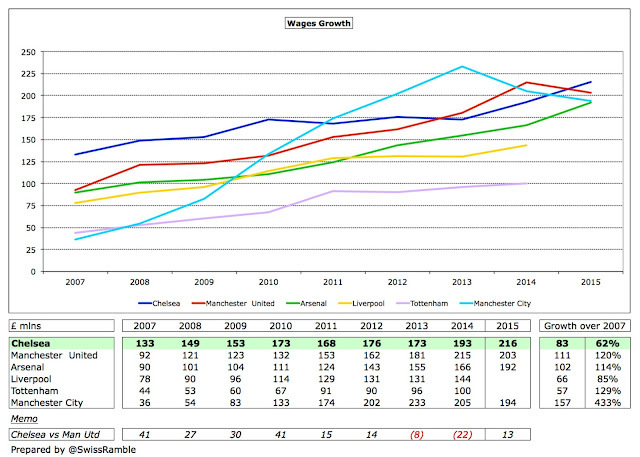 Chelsea’s huge profit that season was largely due to the sales of David Luiz to Paris Saint-Germain, Juan Mata to Manchester United and Kevin De Bruyne to Wolfsburg. Of course, Chelsea are no strangers to making losses in the Abramovich era, as they have invested substantially to first build a squad capable of winning trophies and then to keep them at the top of the pile. Since the Russian acquired the club in June 2003, it has reported aggregate losses of £684 million, though there has been much improvement after the spectacular £140 million loss in 2005 with Chelsea posting profits in two of the last four years. The first profit made under the Abramovich ownership was a small £1 million surplus in 2012, though this owed a lot to £18 million profit arising from the cancellation of preference shares previously owned by BSkyB. On the other hand, Chelsea have consistently suffered from so-called exceptional items, which have increased costs by £127 million since 2005, due to compensation paid to dismissed managers £61 million, impairment of player registrations £28 million, the early termination of a former shirt sponsor £26 million, tax on image rights £6 million, the impairment of other fixed assets £5 million and loss on disposal of investments £1 million. That’s an average of around £12 million year, but was particularly relevant in 2011, when £41 million of exceptionals “had a significant impact on the size of the losses”. Next year’s accounts will again be hit by Mourinho’s pay-off. Although this has been reported as various sums, most sources suggest that this will be restricted to one year’s salary, even though he signed a new four-year contract last summer, but that would still amount to £9-10 million. However, it is profit from player sales that is having an increasing influence on Chelsea’s figures. In the seven years between 2005 and 2011, Chelsea averaged £10 million profit from selling players, but this has shot up to an average of £38 million in the four years since then. In particular, Chelsea’s figures have benefited from £107 million from player sales in the last two seasons. Their reliance on this activity is underlined by the fact that they would have made a loss of £46 million in 2014 instead of a £19 million profit without these transfers. Chelsea noted that six players had been sold at a profit of £21 million since the latest accounts closed, including Petr Cech to Arsenal, Filipe Luis to Atletico Madrid and Oriol Romeu to Southampton. 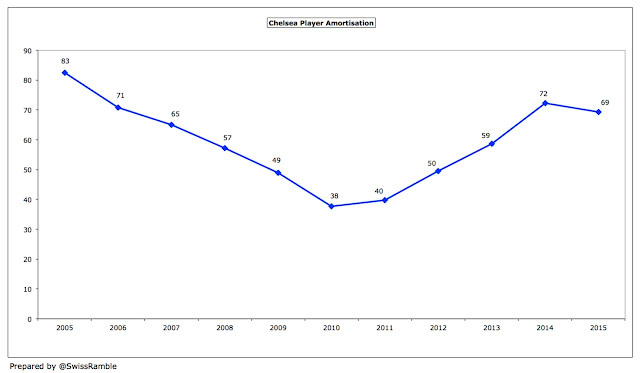 They also received £6 million in respect of sell-on clauses for players transferred in previous years. 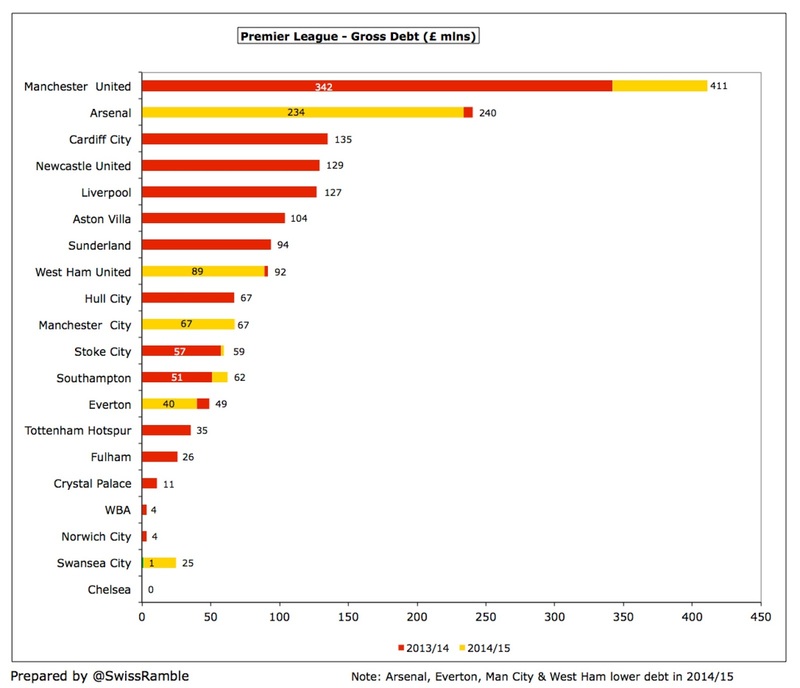 "This Cesc is not on fire"
This is clearly lower than the last two years, though there could still be more to come in the January transfer window, e.g. Juventus are rumoured to want to make Juan Cuadrado’s loan deal permanent. Chelsea’s extensive use of the loan system is also noteworthy with around 30 players currently listed as being out on loan, including four at Dutch club Vitesse Arnhem, which appears to be an unofficial feeder club. Given that very few of these players have succeeded in establishing themselves in Chelsea’s first team, it would appear that the primary purpose of this strategy is to develop players for future (profitable) sales, while effectively placing them in the shop window. 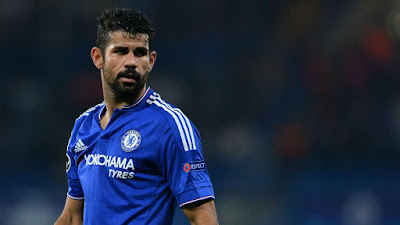 Some of the player wages will be covered by the loanees’ clubs, though it is likely that Chelsea would still have to pay a fair amount, but from a financial perspective the real gains arise after the player is sold. Clearly, not every player will bring in big money, but this approach only needs a couple of lucrative sales to be successful. 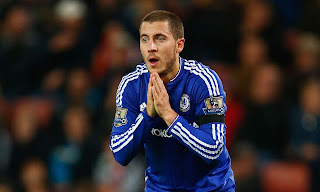 The pipeline of probable upcoming sales includes the likes of Mo Salah, Victor Moses and Marko Marin. Although some might complain that this smacks of treating players like stocks and shares, not to mention ensuring that rival clubs cannot buy this promising talent, there are (currently) no rules against it and other clubs, such as Udinese, have operated in a similar way for many years. It remains to be seen whether more academy players make it at Chelsea, though there are high hopes for Ruben Loftus-Cheek, Nathan Aké, Dominic Solanke, Lewis Baker and Izzy Brown. The other side of player trading is obviously player purchases, which is reflected in the profit and loss account via player amortisation. To illustrate how this works, if Chelsea paid £25 million for a new player with a five-year contract, the annual expense would only be £5 million (£25 million divided by 5 years) in player amortisation (on top of wages). However, when that player is sold, the club reports the profit as sales proceeds less any remaining value in the accounts. In our example, if the player were to be sold 3 years later for £32 million, the cash profit would be £7 million (£32 million less £25 million), but the accounting profit would be £22 million, as the club would have already booked £15 million of amortisation (3 years at £5 million). 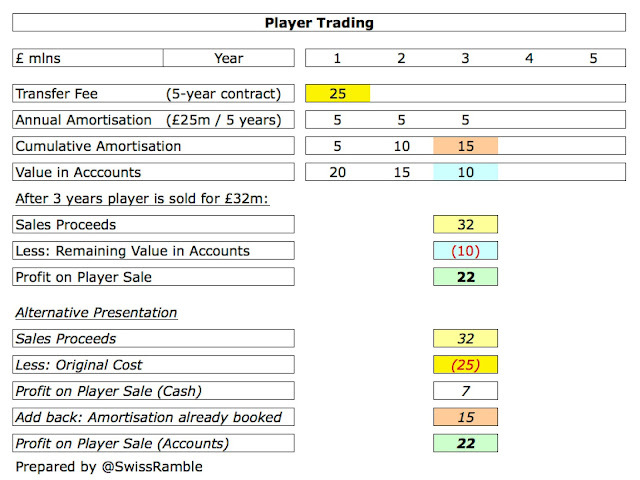 The accounting for player trading is fairly tedious, but it is important to grasp how it works to really understand a football club’s accounts. 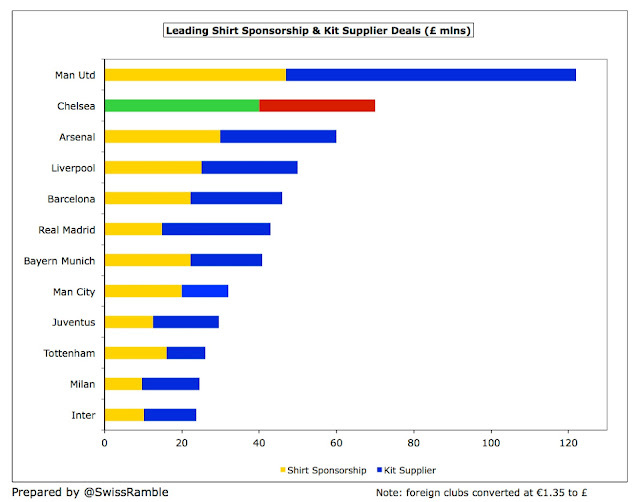 The fundamental point is that when a club purchases a player the costs are spread over a few years, but any profit made from selling players is immediately booked to the accounts, which helps explain why it is possible for clubs like Chelsea and Manchester City to spend so much and still meet UEFA’s FFP targets. 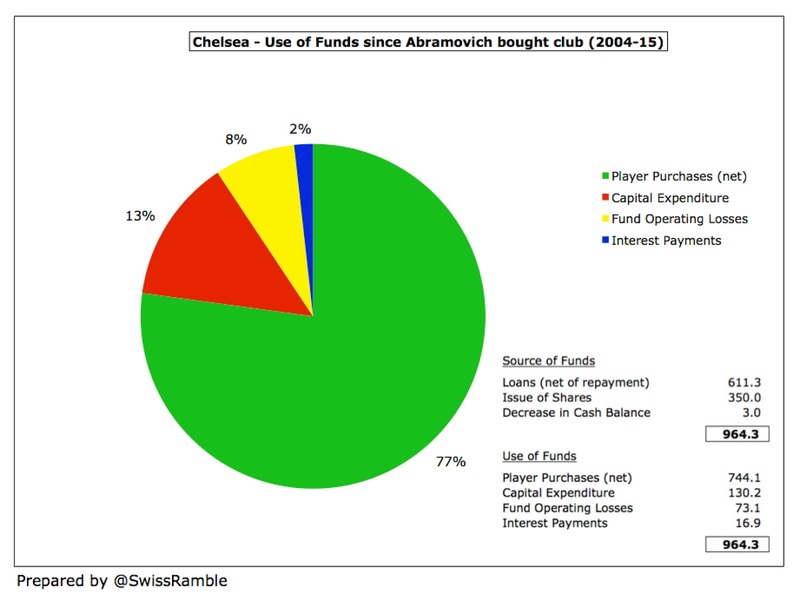 Chelsea’s initial wave of purchases under Abramovich saw player amortisation shoot up to £83 million in 2005, before falling away to £38 million in 2010 in line with less frenetic transfer activity. As spending kicked in again, player amortisation steadily rose to £72 million in 2014, before falling back to £69 million in 2015. Unsurprisingly, this is still one of the highest player amortisation charges in the Premier League, only surpassed by Manchester United, whose massive outlay under Moyes and van Gaal has driven their annual expense up to £100 million, and Manchester City £70 million. The value of Chelsea’s squad on the balance sheet fell slightly to £223 million in 2015, though this understates how much they would fetch in the transfer market, not least because homegrown players are ascribed no value in the books. Chelsea are one of the few clubs to formally acknowledge this factor in the accounts, as they have valued the playing staff at £350 million. As a result of all this accounting smoke and mirrors, clubs often look at EBITDA (Earnings Before Interest, Depreciation and Amortisation) for a better idea of underlying profitability. In Chelsea’s case this metric highlights their recent improvement, as it is has been positive for the last three years, though it did fall from the £51 million peak in 2014 to £16 million in 2015. However, to place that into context, this is way behind Manchester United £120 million, Manchester City £83 million and Arsenal £64 million. 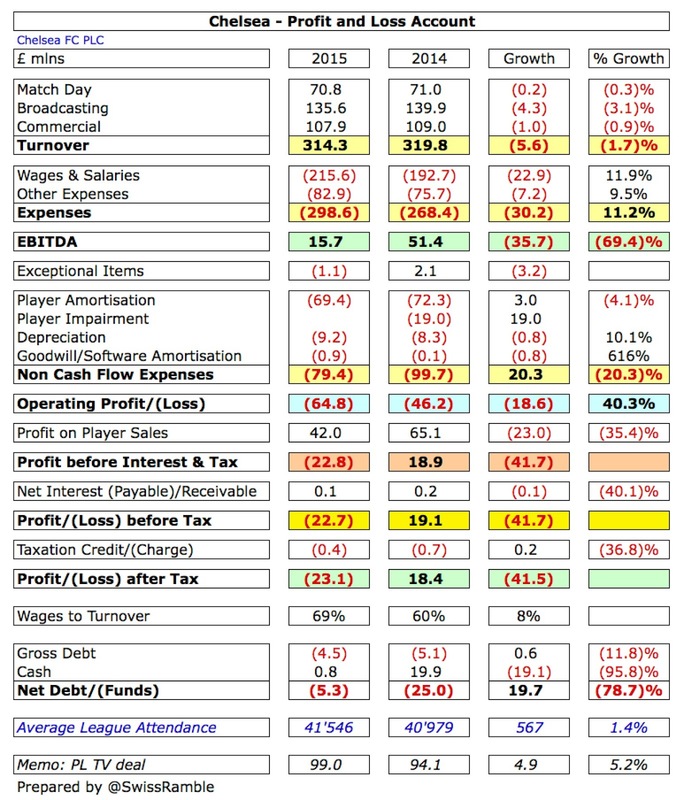 In fact, United’s amazing ability to generate cash is reflected in their projected EBITDA of £165-175 million for 2015/16 following their return to the Champions League and their new kit deal. Despite slipping back in 2015, Chelsea have increased their revenue by 52% (£108 million) since 2009 from £206 million to £314 million. The growth is split evenly between commercial income, which has roughly doubled from £55 million to £108 million, and broadcasting income, which has increased 71% (£56 million) from £79 million to £136 million. In terms of revenue, Chelsea were overtaken by Arsenal in 2014/15, so now have the fourth highest in England, behind Manchester United £395 million, Manchester City £352 million and the aforementioned Arsenal £329 million. However, the lack of growth was disconcerting, especially as Arsenal grew by 10% (£31 million) last season. 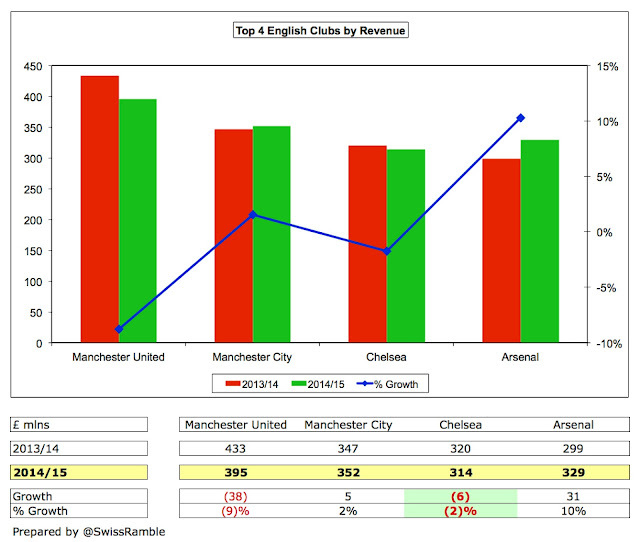 Even though City’s growth was only 2% (£5 million), this was obviously preferable to Chelsea’s 2% (£6 million) decline. 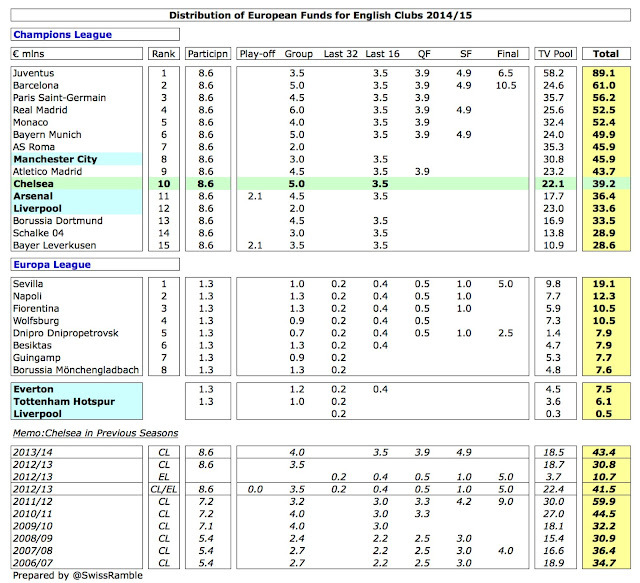 Manchester United’s 9% (£38 million) decrease was due to their failure to qualify for Europe. 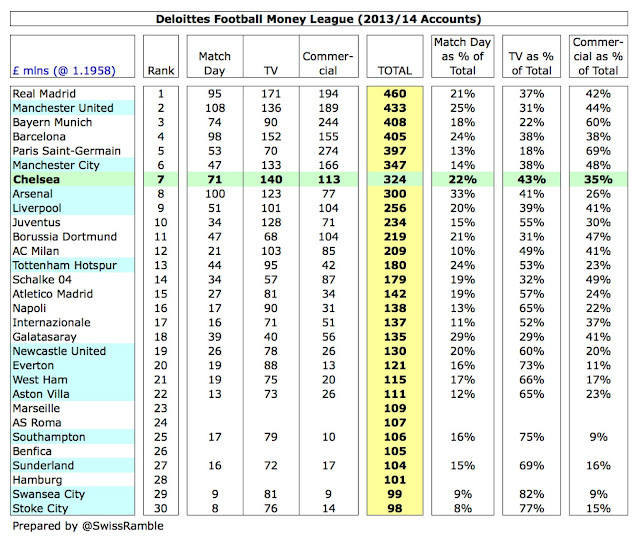 Chelsea’s 2013/14 revenue of £324 million (based on the holding company accounts) placed them 7th highest in world football as per the Deloitte Money League, though Real Madrid continued to lead the way with £460 million, followed by Manchester United £433 million, Bayern Munich £408 million, Barcelona £405 million and Paris Saint-Germain £397 million. The gap to the top is likely to increase in the next edition, as both Spanish giants have announced good revenue growth in 2014/15: Real Madrid up 5% to €578 million, Barcelona up 16% to €561 million. Against that, their revenue in Sterling terms will be impacted by the weakness of the Euro. Furthermore, United are estimating revenue of £500-510 million in 2015/16 following their return to the Champions League and the record Adidas kit deal, which would make them the first English club to break through the half-billion pounds barrier. 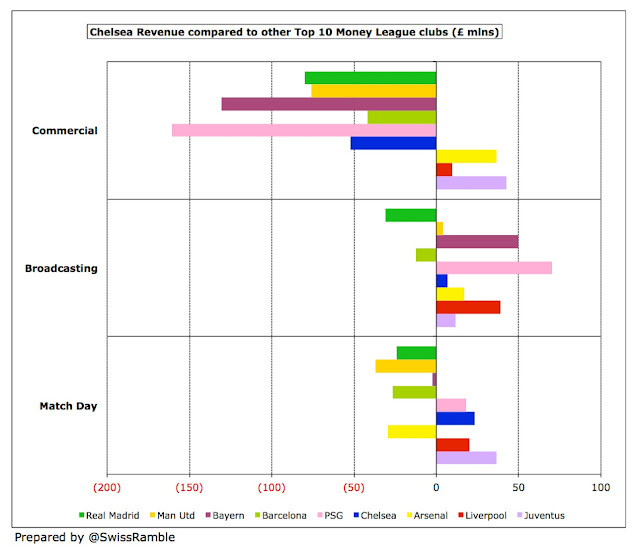 If we compare Chelsea’s revenue to that of the other nine clubs in the Money League top ten, we can immediately see where their largest problem lies, namely commercial income, where Chelsea are substantially lower than their rivals that have traditionally been more successful in monetising their brand: Bayern Munich £131 million (£244 million minus £113 million), Real Madrid £80 million and Manchester United £76 million. The £161 million shortfall against PSG is largely due to the French club’s “friendly” agreement with the Qatar Tourist Authority. 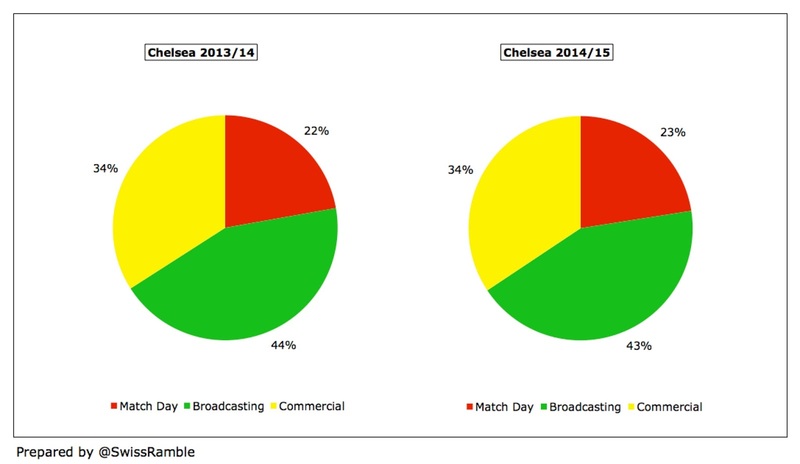 Despite the fall in broadcasting revenue, this still accounts for the largest share of Chelsea’s revenue, though this fell from 44% to 43%. Commercial was unchanged at 34%, while match day rose slightly to 23%. 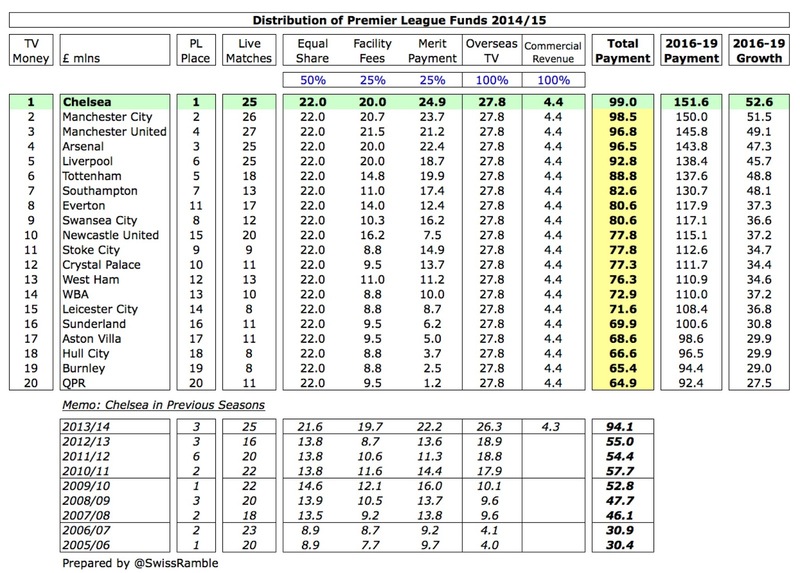 Chelsea’s share of the Premier League television money rose £5 million from £94 million to £99 million in 2014/15, largely due to higher merit payments for winning the league, as opposed to finishing third the previous season. 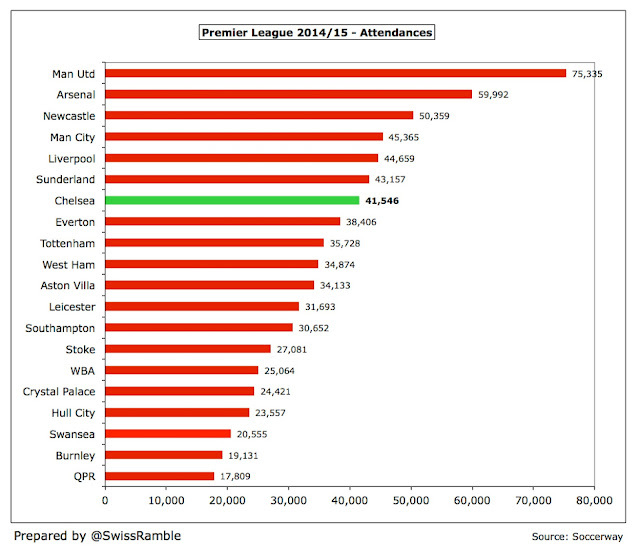 This is likely to fall this season, as Chelsea will finish in a lower place. 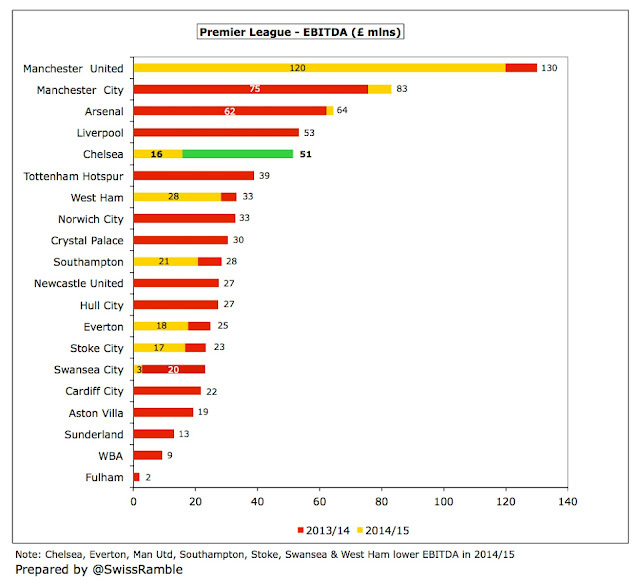 However, there will be a substantial increase from the mega Premier League TV deal starting in 2016/17. 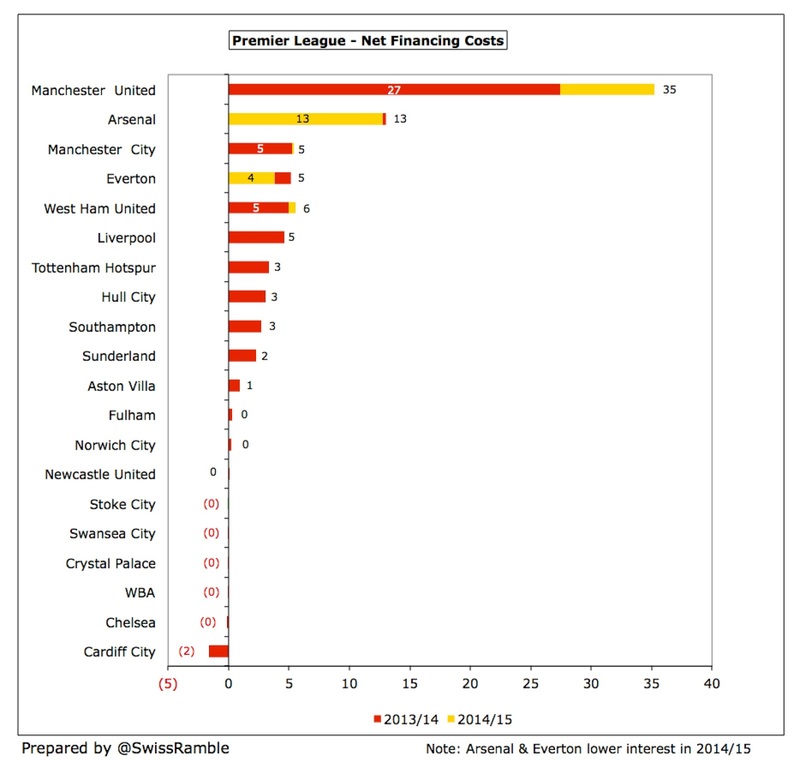 My estimates suggest a place in the top four would be worth an additional £50 million under the new contract. This is based on the contracted 70% increase in the domestic deal and an assumed 30% increase in the overseas deals (though this might be a bit conservative, given some of the deals announced to date). The other main element of broadcasting revenue is European competition with Chelsea receiving €39 million for reaching the last 16 in the Champions League, compared to €43 million for getting to the semi-final the previous season. The reduction was higher in Sterling terms, due to the weakening of the Euro. 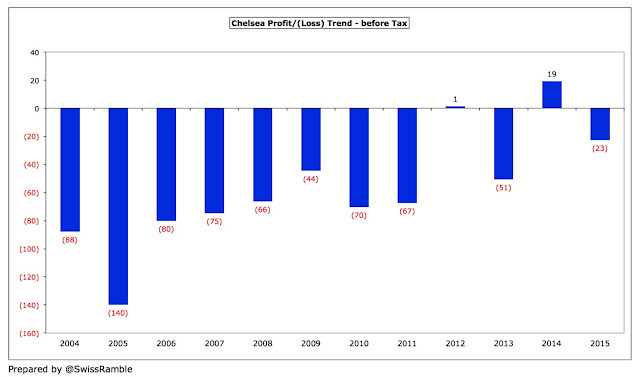 Of course, Chelsea’s European revenue peaked in 2011/12 when they beat Bayern Munich in a dramatic final to win the Champions League. 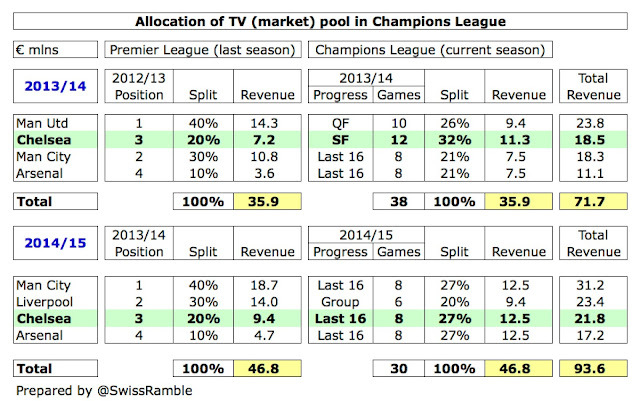 Here, it is worth noting the importance of the TV (Market) pool to the Champions League distributions. First of all, there was more money available in the UK market pool in 2014/15, as this did not have to be shared with a Scottish club (as was the case in 2013/14 with Celtic). Second, the allocation also depends on how many clubs reach the group stage from a country, which explains why Juventus received such an enormous slice of the Italian market pool, as they only had to share it with one other club, while the UK pool was split between four clubs. 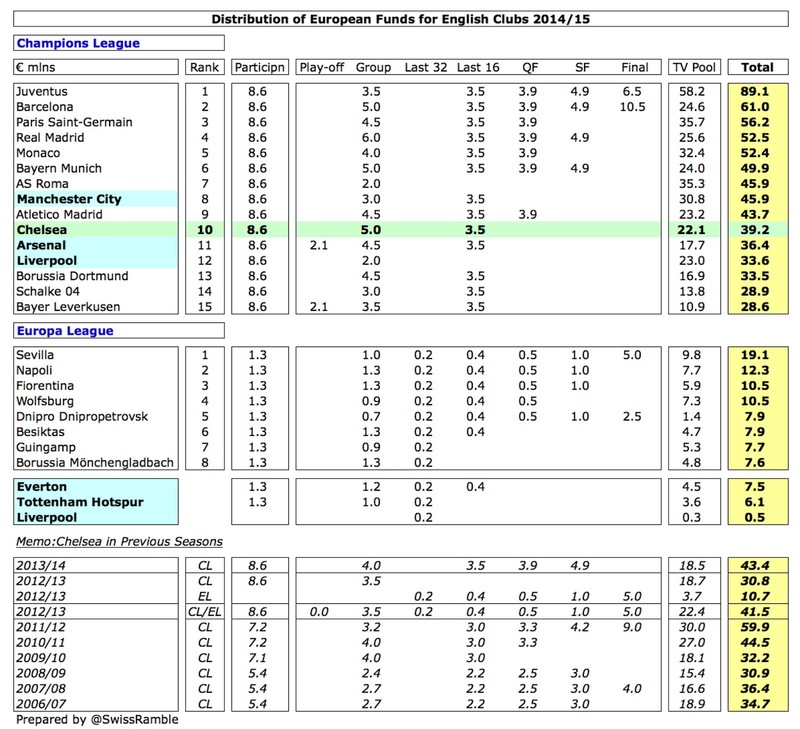 Finally, half of the distribution is based on how far a club progresses in the Champions League, while the other half depends on where a club finished in the previous season’s Premier League: 1st place 40%, 2nd place 30%, 3rd place 20% and 4th place 10%. As Chelsea won the title in 2014/15, compared to finishing third the year before, they will receive a higher percentage in 2015/16. The financial significance of a top four placing is even more pronounced from the 2015/16 season with the new Champions League TV deal worth an additional 40-50% for participation bonuses and prize money and further significant growth in the market pool thanks to BT Sports paying more than Sky/ITV for live games. If Chelsea fail to qualify for Europe’s flagship tournament (for the first time under Abramovich), their revenue would be hit to the tune of at least £40 million (including gate receipts and sponsorship clauses). Match day income was largely unchanged at £71 million with the number of home games staged remaining at 26 (2 more in the League Cup, 2 fewer in the Champions League). 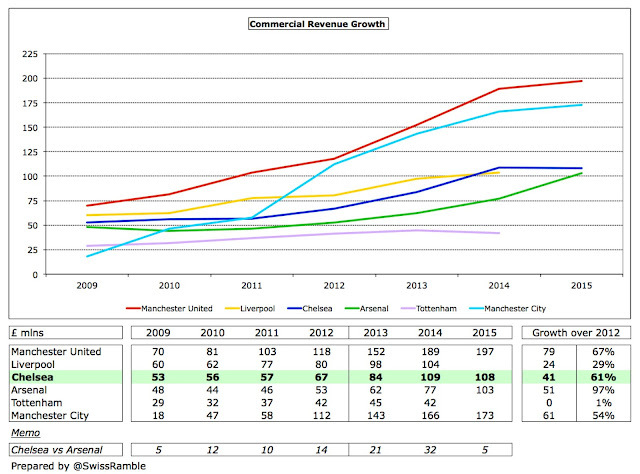 This revenue stream peaked at £78 million in 2011/12, thanks to the victories in the Champions League and the FA Cup. Chelsea’s match day revenue is £20-30 million lower than Arsenal and Manchester United, as they have much bigger grounds, which helps explain why the club has spent so much time searching nearby locations for a new stadium. However, they were outbid for the Battersea Power Station and have ruled out moves to Earls Court and White City. Instead, Chelsea have now submitted a planning application to increase the capacity of Stamford Bridge from 41,600 to 60,000. This would be a complex build with the plan being to lower the arena into excavated ground, but the estimated £500 million cost would be funded by Abramovich. The hope would be to start work in 2017 with Chelsea having to find a temporary home for three years. The club is in discussions with the Football Association to play at Wembley (as are Tottenham who are also planning a stadium move), though Twickenham, the headquarters of the Rugby Football Union, has also been mentioned as a possibility. 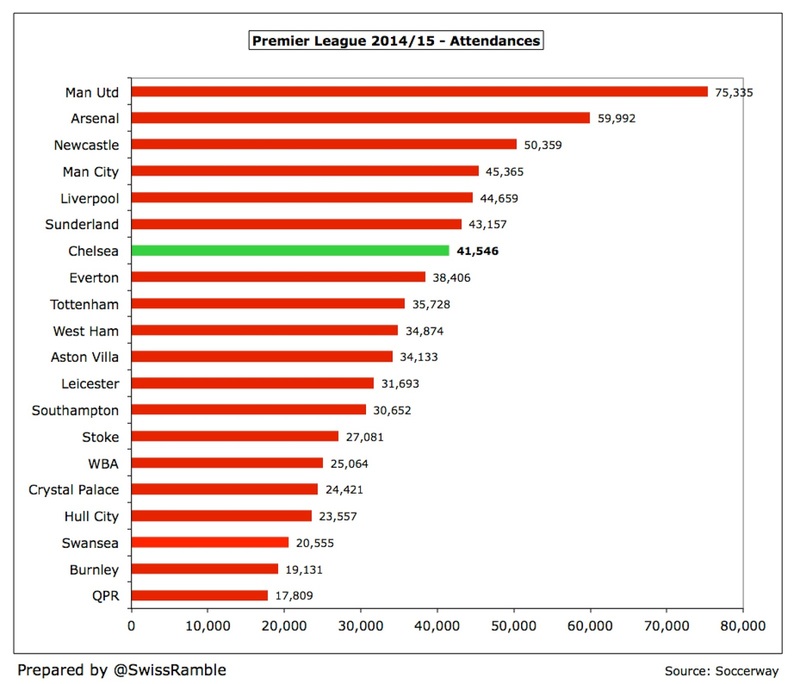 This would cost around £15 million a year, though income might be higher if the crowds increased. 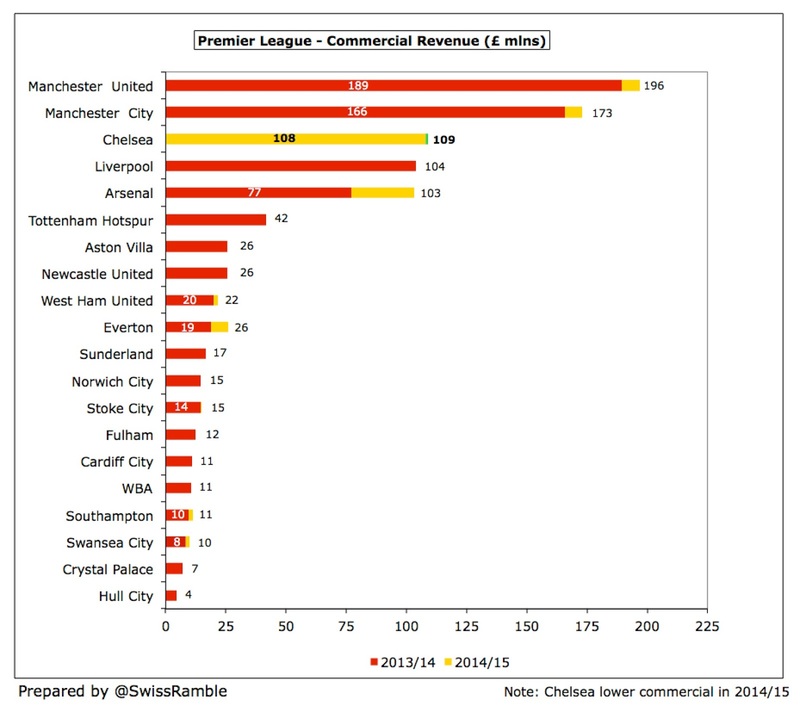 Chelsea have previously highlighted “the need to increase stadium revenue to remain competitive with our major rivals, this revenue being especially important under FFP rules.” More corporate hospitality in particular could deliver significant additional revenue with additional potential revenue from naming rights or other sponsorship opportunities. 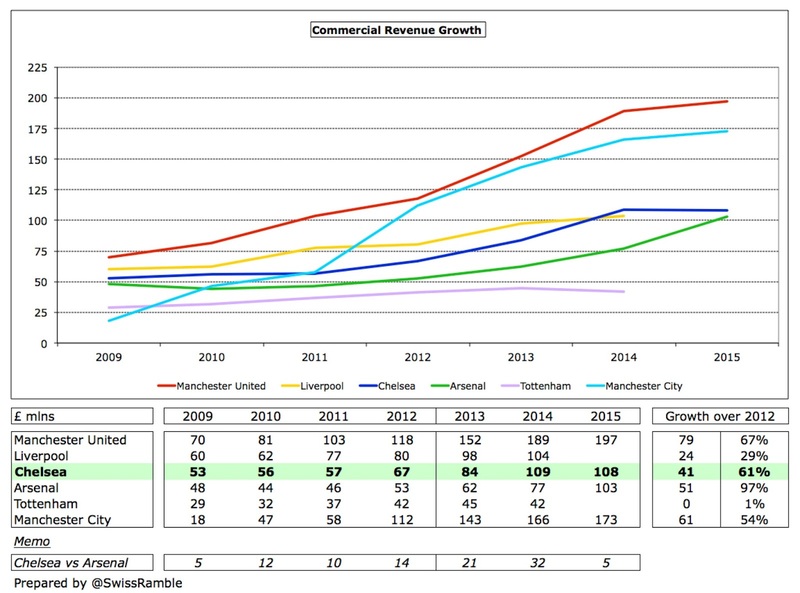 Commercial revenue fell slightly by £1 million to £108 million, which was disappointing, especially as they are the only Premier League club to date to report a decrease in this revenue category in 2014/15. It was still higher than Arsenal £103 million and Liverpool £104 million (2013/14 figure), but it was a long way below Manchester United £196 million and Manchester City £173 million. Over the last three years Chelsea’s commercial income has grown by 61% (£41 million), which would be considered pretty impressive were it not for Arsenal growing by 97% (£51 million) and Manchester United 67% (£79 million) in the same period. However, Chelsea’s commercial revenue will increase in the next set of accounts, as the five-year shirt sponsorship deal with Yokohama tyres started this season. This is worth £40 million a year, i.e. more than double the £18 million previously paid by Samsung. This is on top of the Adidas kit supplier deal, which was extended in 2013 to 2023, which increased the annual payment from £20 million to £30 million. Buck specifically noted that “our program of partnering with world-renowned and innovative market leaders is accelerating”, as seen by a deal with Carabao, a leading energy drink company in Thailand, to sponsor training wear from 2016/17 for a reported figure of £10 million a year. These deals will leave Chelsea only behind Manchester United for the main shirt sponsorship and kit supplier deals and it’s difficult to compete with their massive Chevrolet and Adidas agreements. Wages surged by £23 million (12%) from £193 million to £216 million, reflecting bonuses paid for winning the Premier League and Capital One Cup. This means that the wage bill has risen by £43 million (25%) in the last two years. As a technical aside, note that these wage figures have been corrected for exceptional items, e.g. in 2013/14 the reported staff costs of £190.6 million included a £2.1 million credit for the release of a provision for compensation for first team management changes, so the “clean” wage bill was £192.7 million. The accounts also include a £1.5 million payment to a director for compensation for loss of office. He is not named, but this is likely to be Ron Gourlay, who resigned in October 2014. All this increased the wages to turnover ratio from 60% to 69% following the slight revenue decline in 2014/15, thus reversing the trend of this ratio improving every year from the recent 82% peak in 2010. 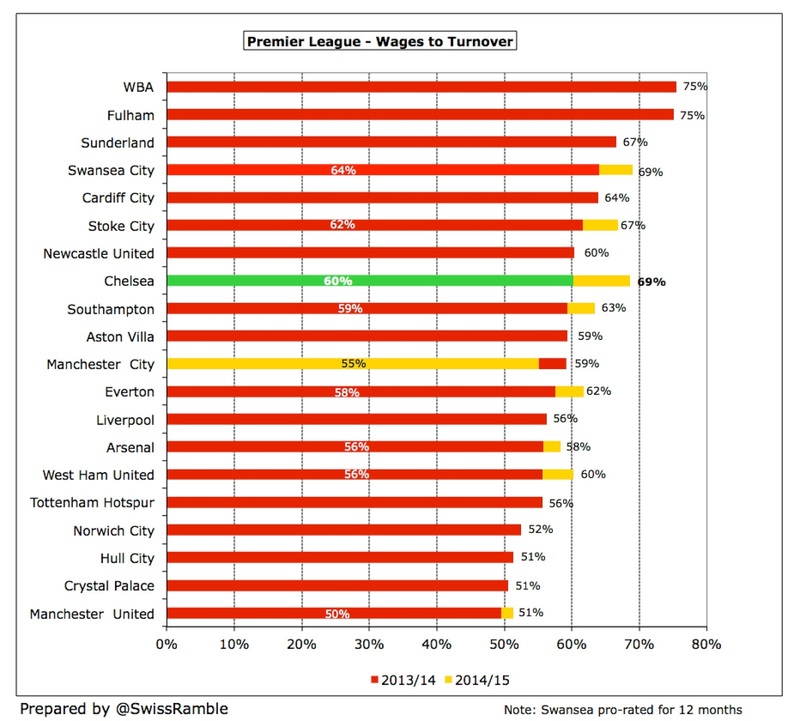 Although the wages to turnover ratio tends to worsen in the second year of the Premier League TV deal, Chelsea’s is still one of the highest with only West Brom, Fulham and Sunderland reporting worse ratios (previous season’s figures). So Chelsea once again have the highest wage bill in the top flight at £216 million, which is the first time since 2010. This is well ahead of Manchester United £203 million, Manchester City £194 million and Arsenal £192 million. There is then a big gap to the other Premier League clubs with the nearest challengers (in 2013/14) being Liverpool £144 million, Tottenham £100 million and Newcastle £78 million. 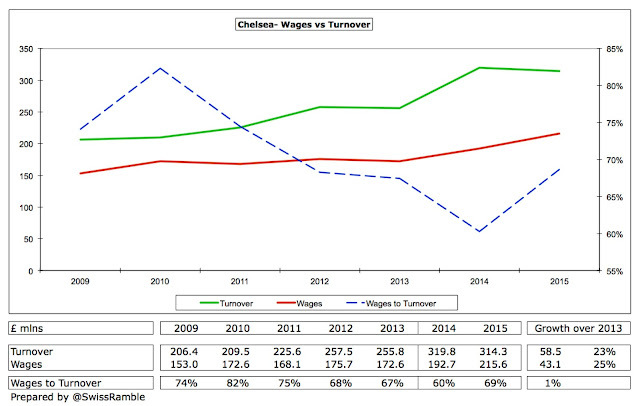 This reflects Chelsea’s stated strategy: “In order to attract the talent which will continue to win domestic and European trophies and therefore drive increases in our revenue streams, the football club continually invests in the playing staff by way of both transfers and wages.” This ambitious approach would explain why the club has not seen fit to insert relegation clauses in the players’ contracts, as the club has finished no lower than sixth in Abramovich’s time. 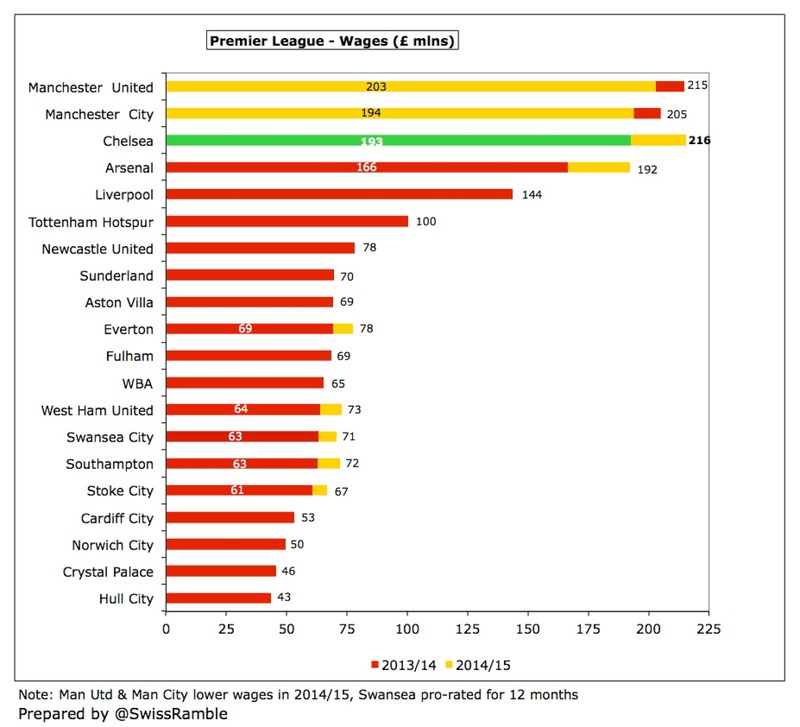 Both Manchester clubs saw reduction in wages in 2014/15. United’s decrease was due to their lack of success on the pitch, as bonuses fell, while City’s is partly due to a group restructure, where some staff are now paid by group companies, which then charge the club for services provided. 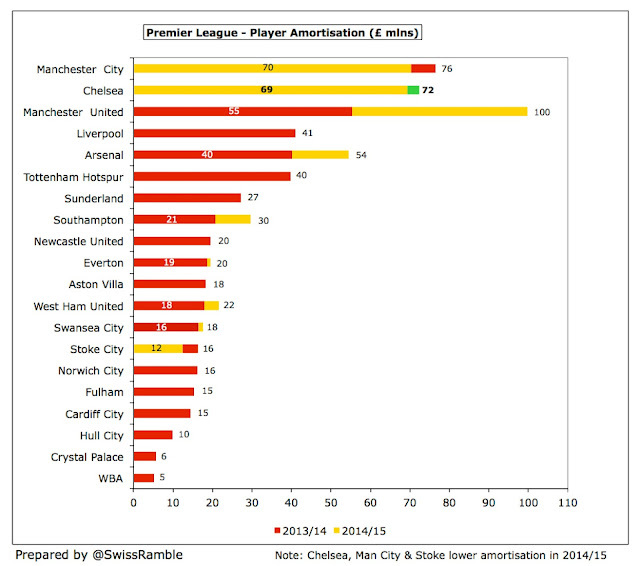 Chelsea’s activity in the transfer market is interesting. 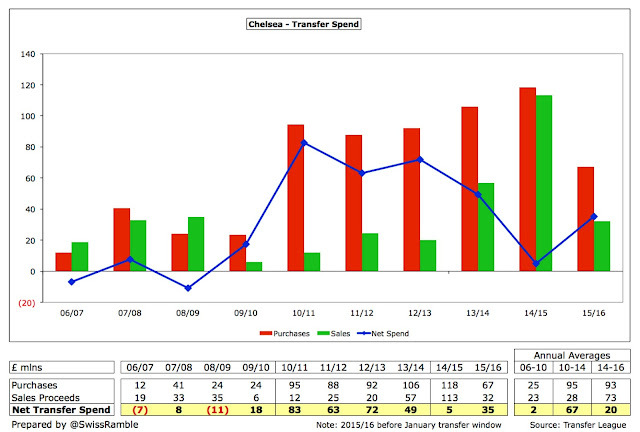 For the four years up to 2010 Chelsea only had average gross spend of £25 million (net spend being just £2 million), but they then returned to spending big, averaging £94 million of gross spend in the last six years. In the last two seasons alone they spent £186 million bringing in new players, including Diego Costa, Cesc Fabregas, Juan Cuadrado, Pedro, Baba Rahman, Filipe Luis and Loic Remy. However, there is a big difference in net spend. The average annual net spend between 2010 and 2014 was £67 million, but this has fallen to only £20 million for the last two years, thanks to equally big money sales, which did not exactly ease Mourinho’s frustrations. 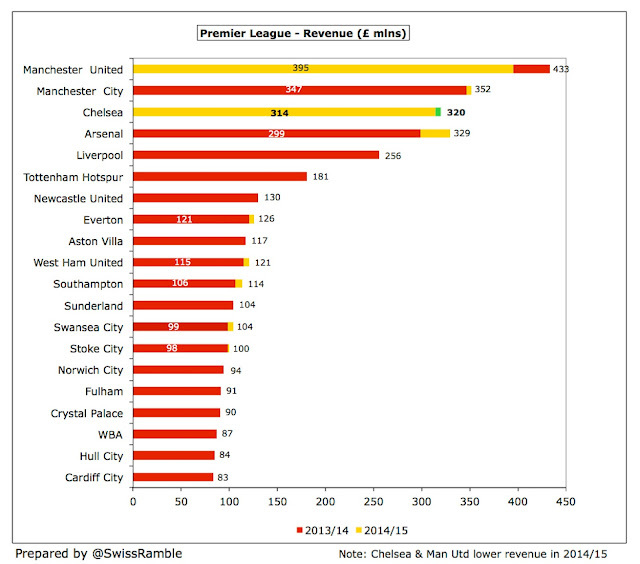 It may be a surprise to some, but Chelsea’s total net spend of £40 million in the last two years was only mid-table. 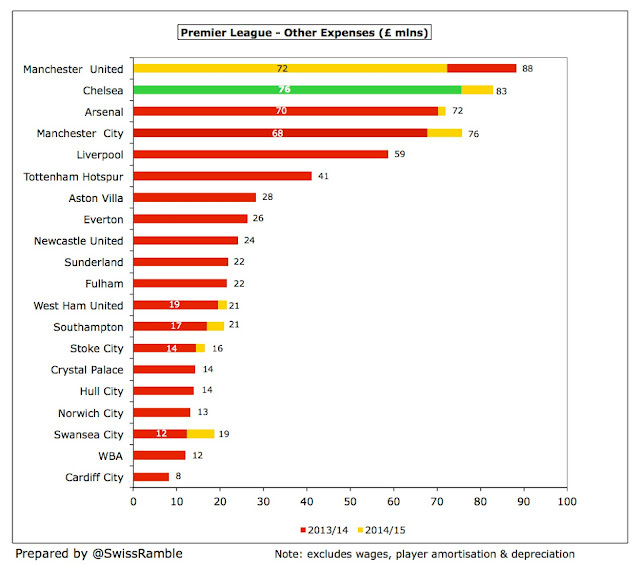 Not only were they over £100 million behind the Manchester clubs (City £151 million, United £145 million), but they were also outspent by the likes of West Ham, West Brom and Crystal Palace in this period. 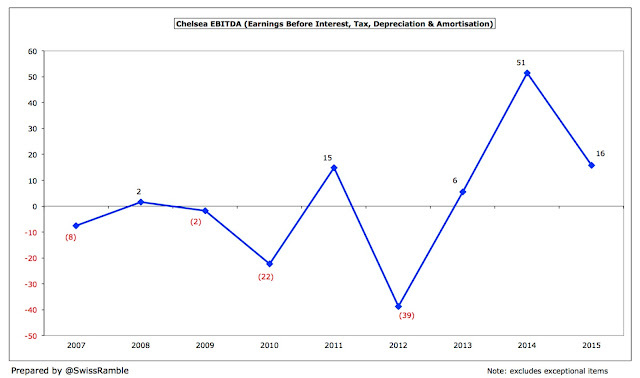 Chelsea have no financial debt in the football club, as this has all been converted into equity by issuing new shares. That said, the club’s holding company, Fordstam Limited, does have over £1 billion of debt (£1,041 million as of June 2014) in the form of an interest-free loan from the owner, theoretically repayable on 18 months notice. Not that it makes much difference, given Abramovich’s willingness to continue to fund the club, but Chelsea noted in the accounts that they had acquired eight players at an initial cost of £69 million this summer. 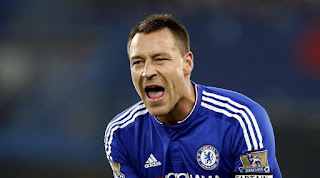 There were also minimal contingent liabilities of £1.5 million, suggesting that Chelsea, unlike most football clubs, pay all their transfer fees upfront, which must be an advantage in negotiations compared to other clubs that have to pay in stages. Other clubs have to carry the burden of sizeable debt, notably Manchester United who still have £411 million of borrowings even after all the Glazers’ various re-financings and Arsenal, whose £234 million debt effectively comprises the “mortgage” on the Emirates stadium. The advantage of having a benefactor like Abramovich is demonstrated by the annual interest payments at those clubs: £35 million for United, £13 million for Arsenal. 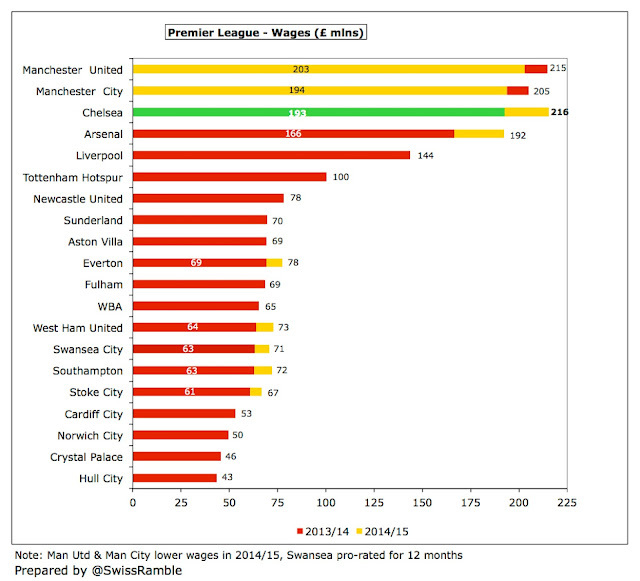 That is money that could be spent on transfers or player wages. 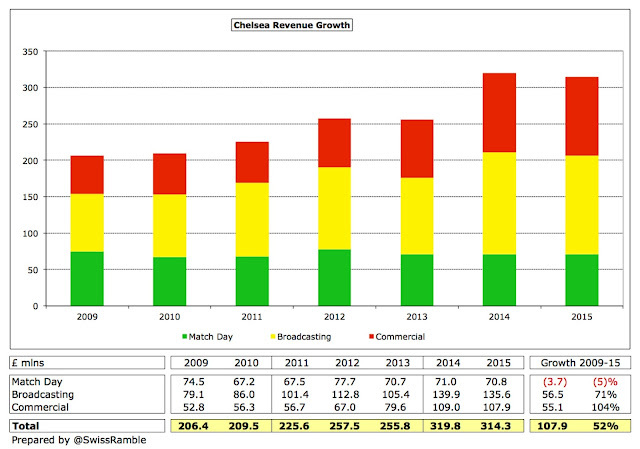 Although Chelsea’s cash flow from operating activities has turned positive in the last three seasons (after adjusting for non-cash flow items, such as player amortisation and depreciation, plus working capital movements), they still require funding from the owner to cover player purchases and investment in improving facilities at Stamford Bridge and the training ground at Cobham. That amounted to £104 million in the last two years: £47 million in 2015 and £57 million in 2014. In fact, since Abramovich acquired the club, he has put around £1 billion into the club, split between £611 million of new loans and £350 million of share capital. In that period £672 million of loans have been converted into share capital. Most of this funding has been seen on the pitch with £744 million (77%) spent on net player recruitment, while another £130 million went on infrastructure investment. A further £73 million was required to cover operating losses with £17 million on interest payments (in the early years). Even though Chelsea are compliant, it is clear that this legislation has been at the forefront of the club’s thinking, hence their focus on earning more commercially. The accounts state: “FFP provides a significant challenge. The football club needs to balance success on the field together with the financial imperatives of this new regime.” In other words, Chelsea cannot simply spend their way out of trouble. 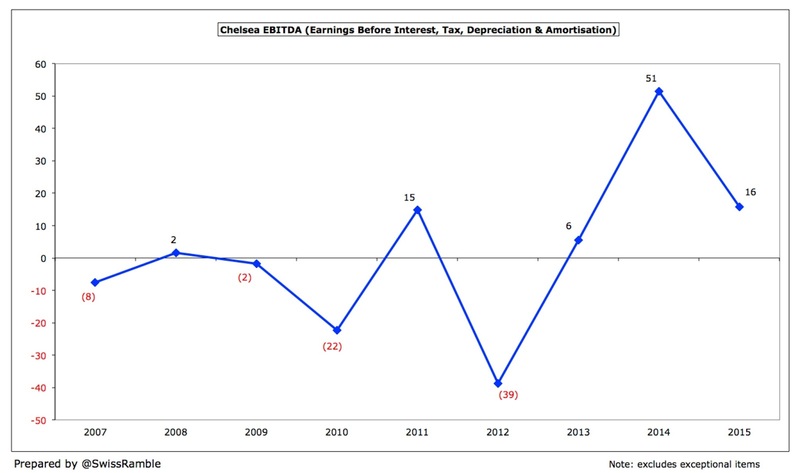 Looking ahead, Chelsea’s 2015/16 accounts will benefit from the Yokohama shirt sponsorship (£22 million higher) and more money from the Champions League (new TV deal, market pool benefit of entering competition as Premier League champions). 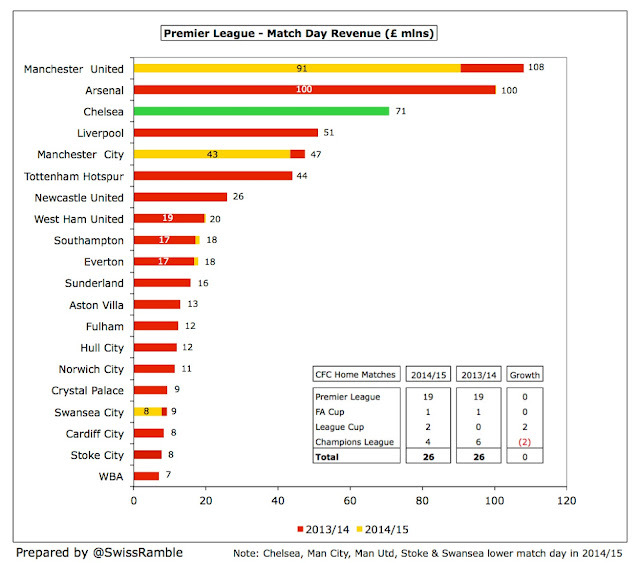 However, they will be hit by the Mourinho pay-off and reduced TV money for a lower Premier League finish (e.g. merit payment difference between 1st and 12th is £14 million). Against that, bonus payments should plummet, which would reduce the wage bill. The following season (2016/17) will again be a mixed bag. Not qualifying for Europe would mean a revenue reduction of at least £40 million, though costs would also fall, e.g. staging home games, travel, bonus, etc. There would also be the cost of rebuilding the squad in the image of the new manager, More positively, Chelsea would be boosted by the new Premier League TV deal and the training sponsorship contract. 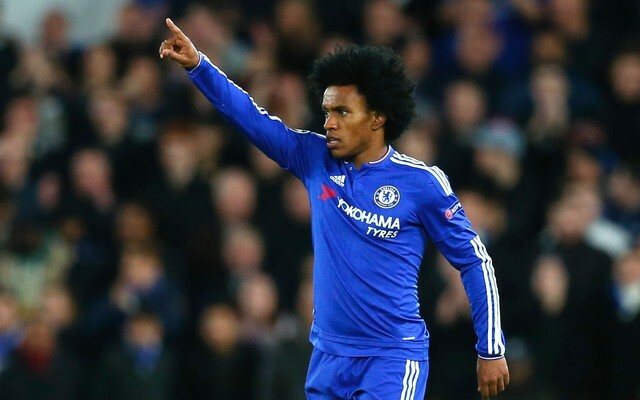 "Willian, it was really something"
Longer term, it will be all about the stadium development at Stamford Bridge, but that is very much future music. Such developments rarely go smoothly, especially in an urban environment, as opposed to a green field site. It’s incredible what a difference a year can make: twelve months ago everything looked rosy in Chelsea’s garden, but this season has seen one problem after another. The vast majority of other clubs would still prefer to be in their position, but the Roman empire has looked shakier than at any other period in recent times. Nevertheless, it would be a brave man that bet against a Chelsea recovery, though a lot will depend on who arrives as permanent manager in the summer. 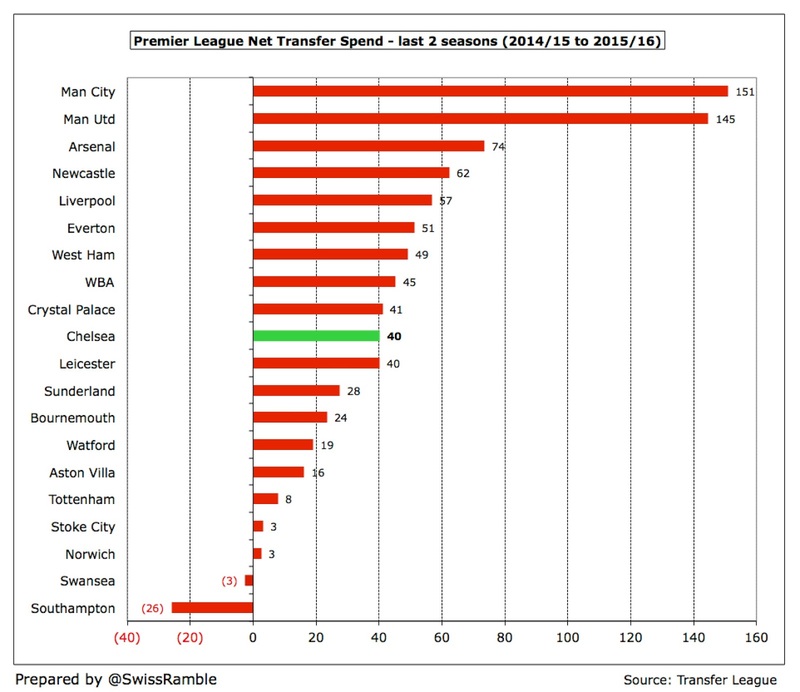 Was particularly interested in your line on Chelsea essentially paying up all of its transfer fees up front (£69mln vrs £1.5mln in future liabilities) -- explains how Chelsea are able to move so aggressively in the transfer market. Are any other clubs doing this? Per FootyLeaks, it seems that Man City paid around 90% of Porto's fee up front -- so maybe them? Thank you! I'm reading your articles at first time. Very informative and interesting!